The next paradigm towards enhancing vehicle safety and road transportation represent cooperative systems. 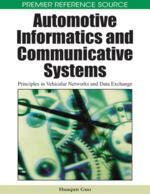 Advances in computer and communications technologies are facilitating the establishment of vehicle-to-vehicle (V2V) and vehicle-to-infrastructure (V2I) wireless communications links. This enables the sharing and aggregation of information which results in an extension of the driver awareness horizon in an electronic manner. In this chapter, V2V and V2I applications are considered as a spatio-temporal problem. The tenet is that sharing information can be made only if this is time stamped and related to a spatial description of the information sources. The chapter formulates the spatio-temporal problem having as constraint the precision of the pose estimates of the vehicles involved. It regards the localisation problem and accuracy of digital road maps as a combined issue that needs to be addressed for the successful deployment of cooperative vehicle applications. Two case studies, intersection safely and an overtaking manoeuvre are included. Recommendations on the precision limits of the vehicle pose estimations and the potential uncertainties that need to be considered when designing V2V and V2I applications complete the chapter.